You are here: Home / Blog / Cleaning / Does cleaning mold stop it from growing? Does cleaning mold stop it from growing? Think of mold like an iceberg. The part you see above the surface is the smallest part. It is because of this that cleaning mold is ineffective. In fact, it can be even dangerous. If you do not have the proper protective gear, cleaning mold can make the spores airborne which makes them easier to ingest. Not to mention that cleaning mold only remedies it at the surface level. Mold will often penetrate deep into the surface where it was found and if it is not removed at this root level, it will continue to grow if moisture is present. Moisture control is the key to stopping mold, not the amount of cleaning you do. Even if you clean the mold with bleach, this will not solve the problem at its root level. 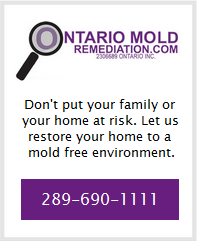 http://www.ontariomoldremediation.com/wp-content/uploads/2016/03/Ontario-Mould-Remediation-Logo.jpg 0 0 admin http://www.ontariomoldremediation.com/wp-content/uploads/2016/03/Ontario-Mould-Remediation-Logo.jpg admin2014-01-27 12:44:422016-03-05 22:20:50Does cleaning mold stop it from growing? For mold removal and flood restoration services visit Ontario Mold Removal. "Thank you Flo. My cinder block shed was a haven of black mould and it was a possible tear down. You have given it a brand new life, cleansed, restored, and free of toxic spores. But mostly thank you for ensuring that the entire shed is now a clean, usable, and most importantly, a safe building. You were efficient, stayed on budget, and you were fun - a bonus!